it provides a unique feeling of safety and well-being. 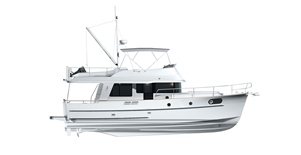 With a unanimously acclaimed hull, the Swift Trawler 44 adapts to all sea conditions and can reach a top speed of 24 knots. Its starboard walkway and flybridge ladder are well protected. The excellent performance of the Swift Trawler 44 gives her reassuringly consistent fuel consumption: between 12 and 19 knots she performs identically. The huge flybridge lounge and her galley increase the number of living spaces on board. The central driving station has outstanding visibility. 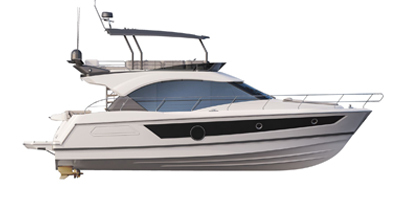 The pleasure of cruising is a joy to be shared on the Swift Trawler 44 flybridge! Large hull portholes bathe the cabins in light. The convertible sofa with separating curtain turns the saloon into private space creating a third cabin in a few seconds. The huge cockpit is a true living space, where you can shelter from the wind thanks to a protecting door.